Designed by Philip C. Johnson in 1948 and built in 1949-50, the former Rockefeller Guest House is one of the earliest buildings in New York City to reflect the influence of the modem movement in architecture and the celebrated German-American architect Mies van der Rohe. The house, which was described by the noted architectural critic Ada Louise Huxtable as "sophisticated . . . handsome, unconventional," is remarkably intact. Johnson's subtle and elegant design incorporates features borrowed from two earlier projects by Mies: his unbuilt "court houses" of the 1930s, and the elevations he designed for various buildings at the Illinois Institute of Technology (hereafter, IIT). Built without the use of traditional ornament, the striking two-story street facade is articulated with precisely arranged structural elements, including a symmetrical first story consisting of a handsome wood door and flanking polished reddish brown ironspot brick walls laid in Flemish bond, surmounted by a grid of six fixed translucent windows faced with four steel H-sections. The house was commissioned by Blanchette Rockefeller, the wife of John D. Rockefeller 3rd and a major patron of the Museum of Modem Art (hereafter, MoMA), to display her collection of modem painting and sculpture and to entertain guests. The Rockefellers donated the house to the museum in 1955, and in the years that followed it had a succession of owners, many of whom were associated with the international art community, including Johnson who lived in the house from 1971 -79. A significant early work by one of the country's leading architects and his only private residential building in New York City, in May 1989 the Rockefeller Guest House became the first work of architecture in the city to be sold by a leading art auction house. In June 1948, the Empire Mortgage Company, acting on behalf of the Rockefeller family acquired a 25 by 100 foot lot on East 52nd Street, west of Second Avenue. It was an ideal location - midway between her home in Turtle Bay on Beekman Place and the museum. On the site were two vacant structures, both dating from circa 1870. Johnson later described them as "completely nondescript, [a] small house, wedged between brick walls, a gap and a weed patch, with a dumpy coach house. "17 This sequence of spaces -closed, open, and closed-would shape Johnson's plan. Whereas most urban townhouses have gardens at the rear of the lot, the "gap" and "weed patch" would become an internal courtyard, filled with water and partly open to the sky. An associate in Johnson's office, Frederick C. Genz, filed plans for the guest house in late 1948.18 Since the existing brick walls were retained, it was classified as an alteration, consisting of mainly plastering, plumbing, carpentry, and masonry work. The project's estimated cost was $64,000.19 Construction began in 1949, and the house was ready for use in 1950. 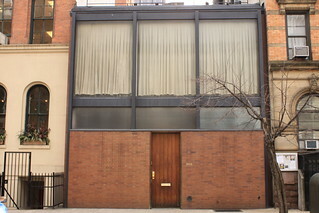 The Rockefeller Guest House was one the first buildings in New York City to reflect the influence of the modem movement in architecture and the celebrated German-American architect Mies van der Rohe. It would also be Johnson's first and only private residential building in the city. Located on the south side of 52nd Street, the simple two-story brick and glass facade stood in sharp contrast to the late nineteenth century buildings adjoining it, a tenement and schoolhouse. Structural elements are revealed as are those of a Gothic cathedral . . . And whereas the medieval architect relied on the collaboration of the sculptor and painter for his ultimate effect, Mies, so to speak, had to perform the functions of all three professions. He joins steel to steel or steel to glass or brick, with the taste and skill that formerly went into the chiseling of a stone capital or the painting of a fresco. Johnson followed Mies's example; rather than embellishing the guest house facade with traditional ornament, he articulated the street facade with precisely arranged structural elements. He divided the two-story facade into two visually-distinct sections. The lower portion of the first floor facade, which projects slightly in front of the windows, consists of a wood door at center flanked by polished reddish brown brick walls laid in Flemish bond. The brick, which resembled that used on the cylinder that enclosed the bathroom in Johnson's New Canaan residence of the previous year, was chosen to compliment the facade of the adjacent schoolhouse. Above the solid base of the first story is a grid of six "unpolished plate glass" windows.22 The mullions that divide the fixed translucent windows are faced with two decorative steel H-sections that rest atop the brick sill. Whereas the second story has vertical floor-to-ceiling windows, the lower horizontal panes act as clerestories, enclosing the upper portion of the first floor facade. These two sets of windows have been traditionally hung with identical white draperies, giving the impression of a single floor above the brick base. The first floor interior (not part of this designation) was designed as a single flowing space. In front was a large living area with a fireplace and a compact kitchen hidden by folding doors, and in the rear, a bedroom with bath and dressing area. Between the rooms was an interior court with a pool that extends the full width of the building. A grid of floor-to-ceiling windows face the courtyard, similar in effect to the courtyard Mies designed for the Chemical Engineering and Metallurgy Building (1945-46) at 13T. Uninterrupted brick walls painted white extended from the living area through the courtyard, providing a neutral backdrop for the owner's art collection; which included pieces by Alberto Giacometti, Hans Arp, Robert Motherwell, Elie Nadelman, Jacques Lipchitz, Jackson Pollock, and Mark Rothko. Above the living area on the second floor (not part of this designation) were two unheated bedrooms and a bathroom. These rooms served two purposes; providing additional space for guests, but also giving the guest house a stronger presence on the street. Johnson later claimed that he designed the second story mainly to "give the facade height" and because a one-story house "would look all wrong. "24 These second-floor bedrooms face the interior courtyard. The Rockefeller Guest House received considerable attention, with articles and photographic spreads in The New York Times, Interiors, and the Architectural Review. House & Home admired the simplicity of the living areas, suggesting that such "restraint" could "help make a cheap house look more expensive. "25 In a 1961 guide to modem architecture in New York City, published by MoMA and the Municipal Art Society, the noted critic Ada Louise Huxtable described the house as "sophisticated . . . handsome, unconventional." While many writers noted Johnson's long-standing debt to Mies and the intricate detailing on the facade, his friend and ally, the critic Henry-Russell Hitchcock, Jr., highlighted the building's "classical leanings" and how the arrangement with a central courtyard resembled "Pompeiian domestic planning." The idea of a quietly serene and empty space at the very core of the house and its busy life is one that might have appealed to Lao Tse the philosopher. Modern architecture's minimalist character is also likely to have appealed to the owners who made frequent trips to Asia and were avid collectors of Asian and particularly Japanese art. White and black predominated throughout the sparsely-furnished interiors, and the pool in the courtyard was traversed by three raised travertine stepping stones that MoMA historian Russell Lynes later speculated were a "concession" to the Rockefeller's fondness toward "things Japanese." Furthermore, round wood pegs, set flush into the outer section of the dooijamb, suggest the hand-crafted quality of traditional Japanese woodwork. During the early 1950s, the Rockefeller Guest House became "an informal arm" of MoMA. In 1954 the house was the site of an exhibition to benefit the activities of the Junior Council. Curated by Barr, Dorothy C. Miller and William Lieberman, it displayed paintings, sculptures and prints owned by various council members. Although The New York Times critic Aline Saarinen was disappointed by the cautious character of the artworks displayed, the exhibition offered the public a rare opportunity to view the elegantly minimal interiors. Despite his antipathy to modern art, John 3rd attended functions at the house and on one occasion he and their children stayed overnight. He regretted the amount of time his wife devoted to running the guest house and eventually convinced her to donate the building to MoMA in the summer of 1955.32 Until the museum's East Wing (designed by Philip Johnson) was completed in 1964, the near-by guest house was used for a various museum events and functions, including receptions, conferences, and special exhibitions. The guest house was purchased by Robert C. Leonhardt, a Manhattan business consultant, in 1964 for $100,000. At the time of the sale, The New York Times described the house as "one of Mr. Johnson's most striking designs. "33 With the death of Mr. Leonhardt in 1971, his widow, Lee Sherrod, sought a suitable tenant, inviting Johnson and his partner, the former art dealer and exhibition designer, David C. Whitney, to lease the house. Johnson, who described their previous residence as a "ratty old two-room walk-up," made few changes, repainting the interiors white and hanging paintings by such celebrated contemporary artists as Roy Lichtenstein, John Chamberlain and Frank Stella. Andy Warhol, who occasionally visited Johnson, admired the openness of the plan, calling it "a prototype of loft living in New York." Robin Symes, a London antiquities dealer, acquired the house in 1979. Ten years later, in May 1989, he consigned it to the Sotheby's auction house. Sold to Ronald S. Lauder, a MoMA trustee since 1973, the building was described by The New York Times as "the first ever offered at a New York art auction — and the first piece of real estate auctioned anywhere in the world by Sotheby's." Anthony d'Offay, a London gallery owner specializing in modem art, purchased the guest house in the mid-1990s. In May 2000, Christie's auctioned the Rockefeller Guest House. Six bidders competed, and the final price was $11.16 million. The Rockefeller Guest House is located on the south side of East 52nd Street, between Second and Third Avenues. The street facade is symmetrical and two stories high. The lower section of the first story projects forward and is faced with reddish-brown Flemish bond brick with tan mortar, similar to that used on the adjoining school building.36 To the east, the brick facade recedes to metal extending the full height of the building, to brick that extends south and is visible from both the front and the side until it intersects with west wall of the adjoining school building. To the west, the brick facade recedes to metal extending the full height of the building, to brick that extends south to the adjoining tenement building. The entrance is at the center of the first story, marked by a wood door that is divided by vertical lines into seven sections. The historic door, which rises as high as the brick walls, is opened with a brass handle located to the east. At approximately eye level is a peephole, and centered below, a brass mail slot. The historic doorframe is made of identical wood. Round wood pegs, set flush into the outer frame, are visible. The east side of the door jamb incorporates (from top to bottom) a non-historic brass security camera, a brass speaker/microphone, and brass lock. The historic brass saddle, screwed to the threshold, is scored with incised lines. The door head incorporates a flush rectangular lighting fixture. To the west of the door is the building's address "2 4 2" in historic raised brass letters. Below these numbers, close to the ground, is a circular black metal vent. To the far right, near the west edge of the facade, aligned with the vent, is a small non-historic plastic apparatus. To the west of the door, set into the sidewalk, is a non-historic metal grate. Six fixed historic translucent windows rise above the brick facade. Four projecting steel H-sections are welded to the columns that divide and frame the windows. The two outer beams extend the full height of the building, from the roof to the ground, framing the east and west edges of the brick facade and windows. The two center beams rest on the brick facade. A continuous horizontal metal panel, set behind the H-sections, divides the upper and lower windows, creating horizontal clerestory windows that illuminate the first story, and the larger, vertical, floor-to-ceiling, second-story windows. An unadorned metal fence, set back several feet from the front of the building, extends across the roof from east to west. Behind the fence, pipes are visible to the west and east, as well as an irregularly shaped ventilation unit. All of these elements are painted black. At the rear of the building, adjoining the tenement, rises a black chimney.